B's preschool Valentine's Day party is tomorrow. I kinda wish I could go. I mean, a bunch of three year old kiddos decorating cookies, playing games and handing out Valentines? Cuteness through the roof! About those Valentines...I'm not exactly a health nut, but I am health conscious and it seems like sweets always find a way to our house without us even trying. Therefore, I definitely wanted to do a non-candy valentine treat and I thought stickers would be fun. 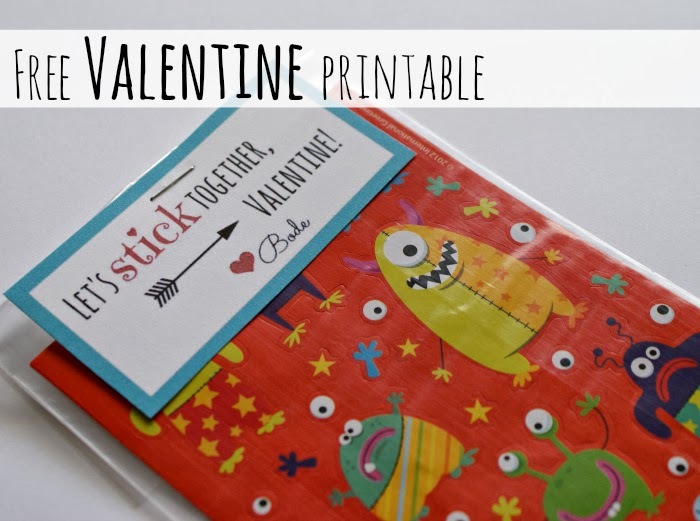 I made little valentine labels using picmonkey and attached them to sheets of stickers. B had fun "helping" me and loved picking out Valentines for his best buddies. Me: Do you think so and so would like the monsters or the animals? B: Well...actually...he doesn't like monsters. Monsters are scary...He'd like the animals! If you need a last minute valentine, you can download a free printable here. I love this! So cute and not candy!! Thank you so much for this FREE printable!! It was just what we needed for the stickers we had already purchased. I try not to send in candy for Valentines or birthdays. Love this!